So Doctor Who is off and running again. And by running, I mean that literally as well as figuratively, the new incumbent in the title role wasting no time to disprove those doubters who felt that he might be too old for the role at the age of 56. On this evidence he’s more than up to the part and just as capable of manic-running-aroundness as even his youngest predecessors in the role were. It makes sense to start this review with the question everyone had on their lips coming into the weekend: is Peter Capaldi going to cut it as the Doctor? To be honest few of us who knew Capaldi’s body of work had any doubt that he would be anything other than completely wonderful in the role, but it’s still the case that seeing is believing and until he finally appeared on the screen there was always just the tiniest chance that it could go horribly wrong. It’s a big relief then to report that instead it’s all gone wonderfully right: Capaldi is fantastic as the Doctor. For the first five minutes I was distracted by watching his performance, but after that I completely forgot about the actor himself because the Doctor was once again just the Doctor, which is just as it should be. This entry was posted in Television and tagged Ben Wheatley, Deep Breath, doctor who, Jenna Coleman, matt smith, Peter Capaldi, steven moffat. I have, perhaps for the first time, the cold certainty that the show has taken a wrong turning and found itself in a cul-de-sac from which there seems no escape, only an inevitable and fast-approaching end. I wrote that sentence in May 2013 at the end of my review for “The Name of the Doctor”, the last episode of season 7. I’d liked the episode well enough but had nonetheless come to the conclusion that Doctor Who urgently needed a major change in direction; and coincidentally just over a week later, series star Matt Smith announced that he was quitting the show. I’m sure he never read my review (well, pretty sure…) and in any case the sentiment wasn’t anti-Smith by any means – indeed, I’ve always considered him an excellent actor well-cast in the role and who has taken the show to new heights. I’m actually very sorry to see him go; and yet at the same time excited, because it gives showrunner Steven Moffat the chance to effect the necessary changes to reverse out of that cul-de-sac in order to set a new direction and revitalise the show – because that sort of rejuvenation of the show itself is ultimately what a Doctor’s regeneration is all about. At the same time the old saying “be careful what you wish for, it may come true” comes to mind. A new Doctor and a new direction for the show is all well and good, but will it be one that I actually like? As of time of writing, it’s almost exactly two weeks to go before Peter Capaldi’s first proper outing in the role hits the screens – although a lucky few select fans in Cardiff and London have already seen the first feature-length 80 minute story “Deep Breath” in special preview showings. So far the response has ranged from “enthusiastically positive” to “utterly rapturous” so the signs are very encouraging – even taking into account the self-selecting supportive nature of the audience. Actually, even the hardened press corps have been joining in with the upbeat assessments. This entry was posted in Television and tagged doctor who, matt smith, Peter Capaldi, Russell T Davies, steven moffat. If you’re one of those fans who worship Doctor Who and its showrunner Steven Moffat and hate hearing a critical word against either, then please look away now or else this might be uncomfortable for the both of us. For while there are undoubtedly some good parts to the 2013 Christmas special – some great parts, in fact, and I promise I will get around to them before the end of this review – I’m afraid that on the whole this is not a positive write-up. How can that be, you ask, coming hard on the heels of the gushing rave review I handed out to the 50th anniversary special just a month ago? Surely things can’t have gone awry in such a short space of time? But that’s exactly the thing with Moffat’s show: to coin a bad metaphor about boxes of chocolates (and also the Fifth Doctor’s own views on regeneration), ‘you never know what you’re going to get.’ One week it might be a thing of beauty and an unmitigated triumph, the next week it might be a damp squib, and then just occasionally you’ll get an episode which aims high but collapses because of rather than in spite of its ambitions. This entry was posted in Television and tagged doctor who, Jenna Coleman, matt smith, Peter Capaldi, steven moffat, The Time of the Doctor. I have a confession to make this week: I was up to my ears in work over the weekend, and was in a distracted mood for everything else that evening, which means that this week’s episode of Doctor Who wasn’t able to really grip me or even sink in properly (and also explains why it’s taken longer to write this post than usual.) I suspect this is mainly my own problem/fault, although if I were being harsh I could suggest that the very fact that the episode ‘happened’ without actually demanding my attention suggests that it wasn’t all that it had been hoped it would be. This entry was posted in Television and tagged Cybermen, doctor who, Jason Watkins, Jenna Coleman, matt smith, neil gaiman, Stephen Woolfenden, Tamzin Outhwaite, Warwick Davis. Contains vague spoiler-y type things. Maybe. Every year, I tell myself I’m not going to be dragged in to write a review of every single new episode of Doctor Who. Or at the very least, to keep them super-short. How much can there be to say week-in, week-out about a single show without looking like a complete geek, after all? It turns out there’s invariably a lot to say (and as for looking like a complete geek – well, guilty as charged. I’ll live.) That’s because the show is so completely flexible that rarely are two episodes alike in style, tone and content, which is almost unique in an ongoing, non-anthology series. Two weeks ago we had a classic “alien monster loose in a ship,” last week it was as close to a “haunted house” story as it could get, and this week it was … Well. This week was certainly very different. This entry was posted in Television and tagged Ashley Walters, doctor who, Jenna Coleman, Journey to the Centre of the TARDIS, Mat King, matt smith, Steve Thompson. The previous week’s instalment of Doctor Who had received (to put it kindly) a mixed reception; which is to say that some people loved it but an awful lot of people despised it. There was a much more unanimously positive response to this week’s story “Cold War” which was a return to familiar ground for the series, both thematically and also in the return of a classic monster from the original Doctor Who series. I can’t say I’ve ever had any particular feelings either way regarding the Ice Warriors. I certainly haven’t been among those clamouring to have them back, like this week’s writer Mark Gatiss who clearly adores them. I remember them vaguely from their appearances in the two 1970s stories set on the planet of Peladon starring the Third Doctor (Jon Pertwee), but if anything they were overshadowed by the much more memorable (albeit marmite) character of Alpha Centauri and therefore didn’t make a huge impression on me. Looking at photos of their original appearances, they certainly didn’t look very imposing or threatening at the time, despite the producers casting the biggest actors they could find for the parts, including Carry On stalwart Bernard Bresslaw. They looked almost cute and curvy and just a little effete. Well, if that was true of the original creature design in the 1960s then there’s no such problem with their 21st century appearance this week, which manages to comprehensively change and update the Ice Warriors while somehow managing to still remain admirably true to the spirit of the original. There’s no mistaking just what this alien is when you see it, but when you view the before and after photos then you realise just how much of a radical upgrade the design has actually gone through. As impressive as the new look and feel of the Ice Warrior is, it’s the sound design that I thought was actually the most stunningly successful: it’s the guttural clicking and gurgling underlying the hissing speech that really chilled my bones and left me feeling genuinely unsettled every time it came over the soundtrack. Really, quite marvellously done, and all in all the return of the Ice Warrior was magnificently achieved – even for those of us who had been less that excited by the prospect of it. For those fans too young to be aware of Ice Warriors, there’s nothing in this episode that would have detracted from their enjoyment either. Direction, set design and atmosphere overall were also triumphs: setting the story in a Cold War-era Russian nuclear submarine under the polar ice cap was brilliant in allowing for a tight, dark, claustrophobic setting that the lighting engineers could really go to town on in an eye-catchingly dazzling fashion. The guest cast was one of the best that Doctor Who has been graced with of late, with Liam Cunningham as the Soviet captain, Tobias Menzies as his first officer and the ever-brilliant David Warner superb of course as the eccentric scientist with a fetish for the Western New Romantic music of Ultravox, Duran Duran and co. The episode had a strong, gripping if rather obviously derivative premise: a isolated Ice Warrior is let loose on the sub, making “Cold War” a monster mash of the likes of Alien, The Thing, The Abyss and countless others. Still, no bad thing there – Doctor Who has always been at its best when ‘borrowing’ liberally from other sources. Gatiss even pulls off a sneaky little surprise with a previously unknown ability of the Ice Warrior to shed its turtle-like shell, slip it off and move more freely around the sub: not only does this allow the threat to diversify into a scary unseen menace dashing through the shadows and behind the walls, it also allows the now-vacant shell suit of armour to become a secondary threat late in the day in a splendid raising of the stakes. Just because it works so well within the context of this instalment I’ll cheerfully forgive Gatiss for taking liberties with classic Who mythology, and for making the Ice Warriors into something of an unoriginal variant on the concept of the Dalek Mark III travel machines. I’ll even overlook the less-than convincing CGI for the ‘true’ appearance of the Ice Warrior. At the end of all this praise it seems that this should be a gushing two-thumbs up rave review. 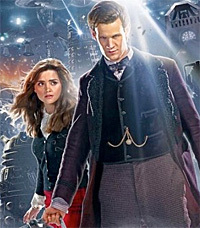 Certainly most people have hailed it as the best New Who in years. Maybe it is, and maybe I’m being churlish, but despite all the glorious trappings there was still something missing from the core of this episode for me. It felt as hollow as the vacated suit of empty Ice Warrior armour, as though someone had failed to give the heart of the thing the proper substance it needed. For one thing, that impressive supporting cast was somewhat squandered by being given very little to do other than act as window dressing, monster fodder and provide a hint of conflict and/or humour when required. Basically, once revived from a block of ice the Ice Warrior simply sneaks around the sub picking up tips on its enemy, then figures out it should head off to the missile room to start World War 3 between east and west (and how many young fans are really going to understand the reality of that threat in the way that the fortysomethings like Gatiss and myself did who grew up in that perilous era?) But then the Doctor – lacking any other ideas and options – asks him pretty-please not to, and the fearsome, remorseless and pitiless Skaldak is revealed as being just a little misunderstood, metaphorically shrugging and saying “Yeah, okay then’ as he tousles the Doctor’s hair affectionately. It’s the second time in a row that a fearsome foe has been vanquished by being given a talking to, and while this approach was once daring and imaginative now it’s becoming rather an unfulfilling cliché within the show. Personally I think the episode became hostage to its own success in producing such a tense, nail-biting atmosphere of dark horror early on. This is scary stuff for kids watching at 6pm, so where does that leave the episode for the rest of the story? It can’t raise the stakes into full blown horror because that would be clearly inappropriate for the time slots given the audience. No surprise that the episode has no where to go except a talkie letdown. It’s a shame that the story didn’t keep its focus more on the atmospheric bits that worked to perfection – the tense, nail-biting slow burn at the start. Having the Ice Warrior thawed out in the first two minutes before the main title sequence was a major lost opportunity. Such long slow build-ups are the very hallmark of what gives Alien, The Thing et al their power. Having the Doctor frantically trying to persuade the Captain and his crew not to go ahead with the defrosting as he alone knew what would happen if they did would have been an excellent way of building and sustaining the tension while also giving the supporting cast something more meaty and dramatic to do working opposite Matt Smith and Jenna-Louise Coleman – both of whom excellent as always, by the way. Instead, sadly, that whole sequence is lost and something far less compelling is substituted. “Cold War” was an episode so nearly there, then, but ultimately not quite. Although without question a much stronger outing than the previous week’s and by no means a bad episode, it was one that could have been a great one with a little work but which ultimately just failed to quite catch fire on all boosters. Doctor Who continues on BBC1 on Saturday evenings starting around 6.30pm, with repeats on BBC and also available on the BBC iPlayer. Series 7 part 2 is out on DVD and Blu-ray on May 20. This entry was posted in Television and tagged David Warver, doctor who, Ice Warrior, Jenna Coleman, Liam Cunningham, matt smith, Tobias Menzies. The audience reaction to last week’s season opener appears to have been largely positive albeit with a sizeable churlish minority carping away in the background. If that’s true then the reaction to the second episode of the eight-episode half-season could be said to be the mirror image: largely negative, but with an enthusiastic minority singing its praises. This entry was posted in Television and tagged doctor who, Jenna Coleman, matt smith, Rings of Akhaten. It’s good to get back underway once more with the stop-start drip-feed of new Doctor Who. “The Bells of Saint John” is actually episode 7 of series 7, which follows on from the final instalment of the Ponds (“The Angels Take Manhattan”) six months ago by way of the one-off Christmas Day special “The Snowmen”, so this is already feeling like the most protracted season of the show of all time. This entry was posted in Television and tagged doctor who, Jenna Coleman, matt smith, steven moffat, The Bells of Saint John.